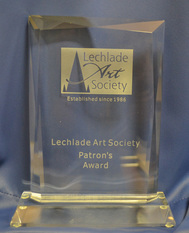 This is an Annual LAS Exhibition Award bestowed to an artist, who is a LAS Member and whose work is in the annual exhibition and which receives highest number of "like" votes from members and the public. Our congratulations go to the winners. The winner of the 2018 Award, Monica Hubbard, for her painting "Collage of Cirencester". Painting entitled "St John's Lock "